There are times when you realize that you have probably always known something but you needed to hear it from someone else for it to affirm within you, it had to come from a source outside of you and find a resonance or reflection from your being, and that is perhaps, surreal. And today I heard that something which I have already heard from mom. Sometimes it almost feels like mom and I share a soul. We say the same things, sometimes chorus whole sentences, thought processes are the same but she is elevated in most aspects while I am still learning the ropes. I happened to go for a meeting where this gentleman happened to mention that he spends 15 minutes meditating everyday during which time he thanks every person that he has come across. Starting from his parents to spouse to children to colleagues, everyone. Including the enemies. Or instead of saying "enemy" let me say people who have wronged him. And whilst he was saying these words, I knew that more, much much more than thanking God for the good people or the good circumstances that we have come to face, we need to be thankful for the trials and tribulations, for times that try us to no end, sprain our brains and wring our minds, curdle our vision and buzz our hearing. For these are times, as the age-old adage goes, the trials by fire that cure us. And it is perhaps imperative that we thank those who wrong us, for if not for them, we remain unchallenged. Unchallenged to push ourselves, stretch our horizons and increase our vision. We would probably be in the Garuda Sowkhyam mode. Sprawled out happily like a cat on her favorite cushion. And here I am reminded of that final line that Mr Prakash Raj said in my interview (I have mentioned the entire verse in one of my earlier posts)- .... do not poison me for I shall become Neelakantha. This verse from that day on has become the silent mantra of my life. Yes despair does happen. Tears do well up and I do sometimes feel like going on top of a mountain and scream my sorrow, probably imagine myself on some Himalayan peak where the scream that I so wish to express, that which would rent my being will escape its confines and get engulfed by the mountains and I would be offered silence and tranquility in return. But in what could perhaps be regarded oblique, I experience the sorrow in its entirety. No postponing there or believing its cowardly to feel sad. Living sorrow then and there, getting it over with and moving on is easier. That said, if there is a point in time when I come to believe otherwise and come to contradict these very lines, there will be a valid reason to do so. And these thoughts are what I believe in at this point in time. And completely. So what I wanted to share with you, now is this. Thank God for the wrong-ers. For they make our lives more exciting. Challenging. The moment you prove that person - who once said you cannot do something - wrong, that moment, I promise you, will be one of those you'll treasure. Enjoy it and of course, once that has been lived, its time to move on. "do not poison me for I shall become Neelakantha." Good one. Can you let me know the post that has the complete transcript? I read your blogs on regular basis... I loved all the ones. Another introspective and perspective post from you. Your posts like this rekindles the thought process in its own way. I don't really know what to say except THANK YOU. When you dont have a way in, you look for the way out but when you dont have a way out, you look with in. Your thought of challenge and treasuring the moment when you have proved someone wrong could just help you go to a certain level which is relatively higher to an already benchmarked level but you might want to start finding a way with in as you are not looking for a way out as, soon there are not going to be any benchmarks and it is going to be a free sky and it is going to be just you flying. I just read one of your earlier blogs and you have mentioned waging war against mediocrity. Mediocrity challenges and is the wrong-er in an abstract sense and as long as the mediocrity is within winning the waged war is just like redefining your own self. But when the mediocrity is out side us, winning that war is just pointless because mediocrity can only be defeated from within. I simply love this post.. just when I needed it the most. Thank u.. I'm full term pregnant and my 'faithful' maid who went back to her hometown did not make it back here and wont make it back. I'm tormented by her absence and I have 2 school going kids. But as the days went by,(today is the 4th w/o her) I believe I can survive no matter what n yes, thanks to the wrong-doers. The complete post is available @ http://chinmayisripada.blogspot.com/2009/01/late-night.html. 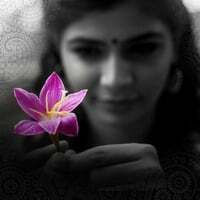 Good Post Chinmayi.. Keep blogging.. This comment has nothing to do with the post. I wanted to get in touch with you regarding "saving our planet" and this, I thought, was the only way. Though I have posted about this on my blog, I feel if u could publish a post on this, a wider range of readers could be covered. Its after all for our planet earth and its upto us to save it!!! Well a typical question asked to every successful woman, keeping aside all clichéd statements, what is your opinion on women liberalization? Also I would like to hear your comments on the recent moral policing acts that took place across country.